TKY's Classic Hard Saddlebags, 26 Liter each are made specifically for Yamaha Roadliner S/Midnight and Stratoliner mounting kit not included because you must use the original Yamaha mounts/ S.
These Classic Hard Saddlebags for Roadliner are made of high quality hand-laid fiberglass which is much stronger than chop-gun fiberglass. The mounting faces are well designed to fit with only Roadliner. They are the best choice for customizing your ride with quality Hardbags at affordable prices. 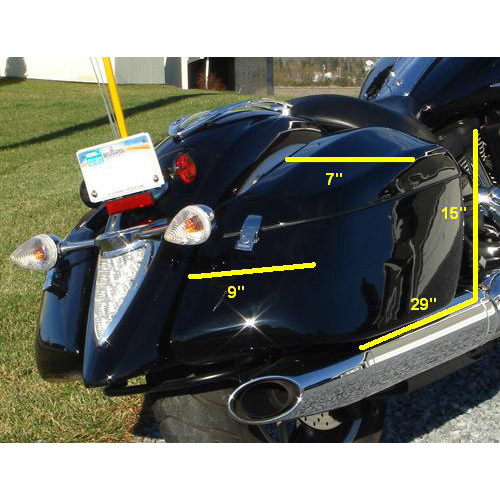 26 Liters of Storage Capacity for each side, the same size as the Stock leather saddlebags and fit with stock quick release mounting brackets directly, you can easily replace your old leather stock bags with durable TKY Hard Saddlebags in just a minute. Your stock turn signals don't need to be removed. The inside is carpet lined which protect your valuable stuff from scratching and bouncing inside the hard saddlebags. Note : NOT include stock quick detachable mounting brackets and quick release pins, and NOT fit with Tsukayu Touring Trunk and Audio Tour Packs.